All of our U.S. Flags are made in the U.S.A. by the leading manufacturers of flags, such as Annin, Valley Forge and Eder to name a few. We are often asked, how long should a flag last outdoors? There is no definite answer to this question. How long any flag will last depends on the weather, its location, airborne contamination and how often you fly your flag. Remember, your flag is a piece of cloth that works very, very hard. Throughout its lifetime your flag shakes, trembles, drapes, snaps, chafes, bakes, freezes, ripples, flutters, furls, twists, flaps, strains, flies, unfurls and hangs! Wind, water, sun and carelessness are the major enemies of a flag. No one can control the weather but you can take some important steps to lengthen the life of your flag. 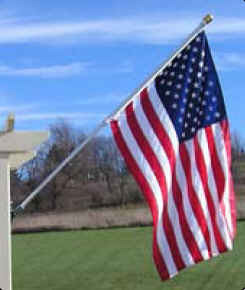 Occasionally washing your flag in warm detergent water will prevent pollutants and dirt from weakening the fabric. 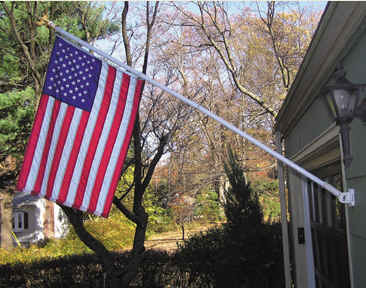 Always let your flag dry thoroughly before storing it to prevent mildew or color transfer. At the first sign of fraying, have your flag repaired before further damage is done. Always keep your flagpole as clean as possible and move your pole if your flag does not have adequate room to fly unobstructed. Following these guidelines will help extend the life of your flag. Typically a flag lasts 10 to 12 months if properly taken care of.